Round staircases are a popular choice for homeowners seeking to make a statement within their homes. Why are curved stairs so popular? Upon entering a home with a round staircase in the foyer, one will automatically feel a sense of prestige and beauty, making a strong impact on your guests. The staircase is an integral facet of design and a grand focal point of the home. A curved stair is more than just a functional path from one floor of a home to the next. 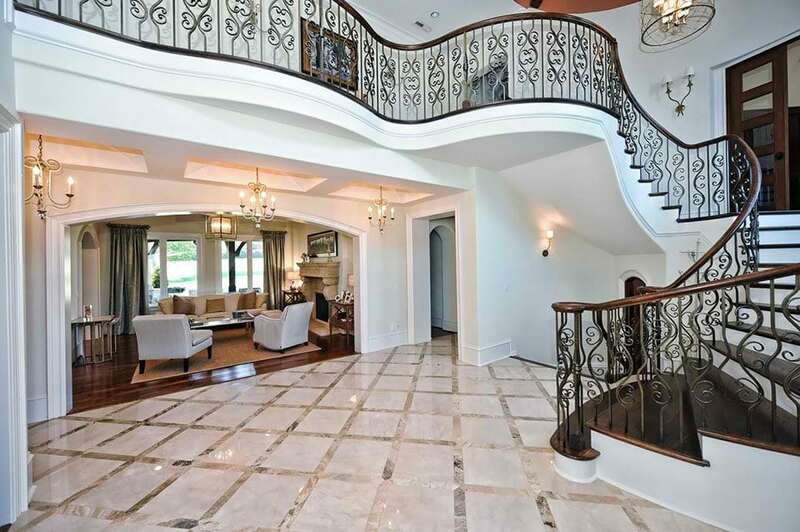 A beautifully designed, custom staircase serves as a piece of furniture – an expression of high-end design and style. Curved staircases, with their grand arcs, create an inviting and welcoming feel to all who enter a residence. This charming effect has led them to become a staple within southern homes. While some prefer clean, modern, straight lines, many homeowners desire curvature within their residences. A round, custom staircase can add beautiful curves to the space, accenting other features including arches and barrel ceilings. Many architects prefer to incorporate round stairs within their residential projects. Due to their beauty and popularity among homeowners, residential curved stairs are often considered signature statements within certain architects’ home plans. 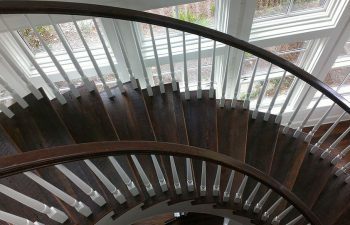 Now, why do homeowners love our round staircases? Our industry-leading design team works collaboratively with homeowners, builders, designers and architects to bring their vision to life, from inspiration to installation. If the homeowner is leading the round staircase project, our team will begin with a homeowner consultation and offer comprehensive design assistance throughout the build. In order to transform an innovative round staircase design concept into a high quality structure, our team will also provide comprehensive engineering services, complete with precise measurements and expert drawings. Whether a client selects one of our popular curved staircase projects or works collaboratively with our design team to develop a one-of-a-kind round staircase, we utilize turnkey processes to ensure seamless and on-time project delivery – every time. Our team constructs each curved stair in our state-of-the-art facility, building the staircase itself and pre-fitting the handrail to maximize aesthetic quality. The stair and handrail systems are then delivered to the job site and installed by our expert craftsmen. Visit our curved stair project galleries for additional details and pictures on our exquisite projects. From inspiration to installation our team is committed to designing and building the highest quality round staircases. Our reputation speaks for itself and client satisfaction is our highest priority. Contact us today to discuss your next custom stairs project.